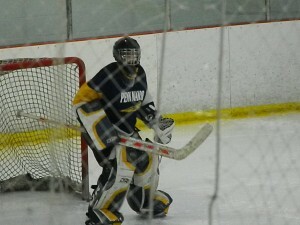 The Penn Manor ice hockey team had an historical comeback to tie Manheim Township Wednesday at Lancaster Ice Rink, 6-6. “We got off to a slow start,” said Jason Green, a junior ice hockey player referring to the two early goals they allowed in the first period. After a quiet first period for the Comets, they were able to get a goal late in the first to lower the deficit to one. The score was 2-1 to begin the second period. Township quickly scored three unanswered goals early in the second period to take a large 5-1 lead. Penn Manor continued its average of one goal a period with a quick tally in the last six minutes. After the second period, the Comets still faced a large task to overcome with the score set at 6-2. The Comets came out in the third period looking like a brand new team, scoring four unanswered goals throughout the third. ome important saves keeping the score tied until the horn sounded to end the third period. “Even though we had some ejections and some penalties, we were still able to come back,” said junior hockey player, Kevin Reinhart after getting ejected. The Comets efforts paid off even without fellow teammates Kevin Reinhart, Nick Young, and Austin Dittenhafer due to ejections and equipment problems. “Even though we had some ejections and some penalties, we were still able to come back,” said junior hockey player, Kevin Reinhart. The intensely close game at Lancaster Ice Rink had fans on the edge of their seats until the end. The stands continue to be packed every home game for the Comets. The efforts of both teams made for an entertaining showing. The Comets who scored were Ryan Pryzbylkowski(2), Matt Gue(1), Nick Cirko(1), Jason Green(1), and Austin Dittenhafer(1). Their next game is against Anville-Cleona at 7p.m. at Klick Lewis Arena on Friday. Eric Schlotzhauer contributed to this article.